» In a palatable base. Pharma-Cyp syrup is an appetite stimulant that incites craving for food and restores appetite in patients suffering from loss of appetite due to other medications or conditions. 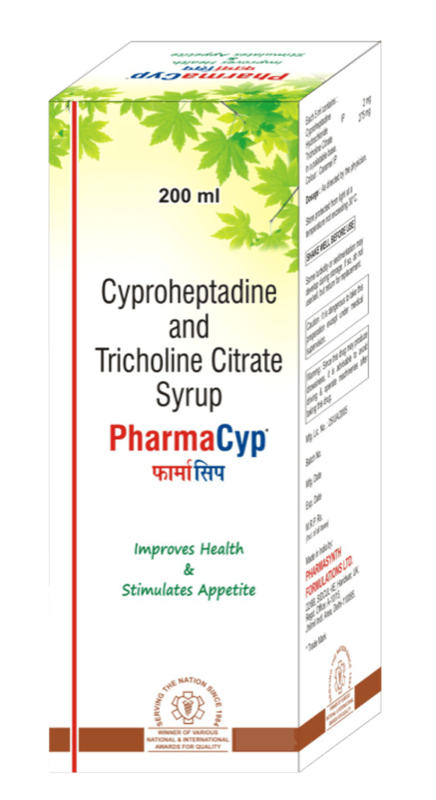 The active ingredients of Pharma-Cyp are Cyproheptadine Hydrochloride and Tricholine Citrate. Cyproheptadine is a histamine antagonist with anticholinergic activity. However, the serotonin antagonism activity of Cyproheptadine is responsible for stimulating appetite and growth. Tricholine Citrate contains three molecules of choline. Choline is an essential lipotropic nutrient that aids in the treatment of fatty infiltration and cirrhosis of liver. It increases bile flow and stimulates pancreatic enzymes. Cyproheptadine Hydrochloride unlike other antihistamines has antagonistic action at even serotonin receptors. This property makes it useful in conditions such as vascular headache and anorexia. It competes with serotonin and blocks its binding at receptor sites in smooth muscle of intestines and other locations. It is postulated that cyproheptadine’s antagonism of serotonin on the appetite centre of the hypothalamus accounts for its ability to stimulate appetite. It also shows antiemetic effects that r regulate gastrointestinal motility and improves digestion by blocking central muscarinic receptors. Choline is needed for neurotransmitter synthesis, cell-membrane signaling, and transport of lipids, methylation reactions and homocysteine metabolism. It modulates the gene expression in many of the pathways involved in liver function and dysfunction by modifying epigenetic marks on DNA and histones. It converts fat into phospholipids like, lecithin, which is essential to biomembrane structure and its function. Choline deficiency is linked to nonalcoholic fatty liver disease, atherosclerosis (via lipoprotein secretion), and possibly neurological disorders. It can be prescribed as an adjunct to anti-tubercular and antiretroviral therapies for weight gain. Pharma-Cyp syrup is contraindicated in patients with known hypersensitivity to any of the ingredients present in the formulation. Adverse effects associated with Pharma-CYP can be attributed to Cyproheptadine. Common side effects: Drowsiness, dry mouth, confusion and ataxia. CNS side effects: sedation (often transient), dizziness, disturbed coordination, confusion, restlessness, vertigo. Respiratory effects: dryness of nose and throat and thickening of bronchial secretions. It is dangerous to take Pharma-CYP except under medical supervision. Cyproheptadine has an atropine-like action therefore, should be used with caution in patients with history of cardiovascular disease, hypertension, bronchial asthma, and increased intraocular pressure and hyperthyroidism. Antihistamines may diminish mental alertness in adults; conversely, particularly, in the young child, they may occasionally produce excitation. Patients should be warned about engaging in activities requiring mental alertness and motor coordination. May cause drowsiness, do not drive or operate machinery, if affected. MAO inhibitors prolong and intensify the anticholinergic effects of Cyprohepatdine. PharmaCYP may have additive effects with alcohol and other CNS depressants like, hypnotics, sedatives, tranquilizers and antianxiety drugs. Cyproheptadine HCl should be used during pregnancy only if clearly needed.